The first three days of SXSW interactive were packed with high-profile speakers from Google's Eric Schmidt to Hollywood high flyers like Kevin Bacon, with a constant stream of activity running alongside scheduled events such as the Spotify House and of course, Oreo's 3D printer. The audience piling into one of the main auditoriums to see Google's Eric Schmidt and Jared Cohen speak. Google executive chairman Eric Schmidt on stage with director of Google Ideas, Jared Cohen, while they are interviewed by Wired writer Steven Levy. Eric Schmidt addresses the audience while discussing the NSA and GCHQ. More playful activity in the Spotify House: "Play trivia. Retweet. Win swag." The band playing in the PayPal social media lounge is called 'Coin'. Wikileaks' Julian Assange speaking via live video link from inside the Ecuadorian embassy in the UK. Kevin Bacon on state with Game of Thrones star Maisie Williams, discussing the 'Six degrees of Kevin Bacon' game 20 years after its inception. The Oreo 'Trending/Vending' 3D printer getting to work on printing a new custom made Oreo cookie. 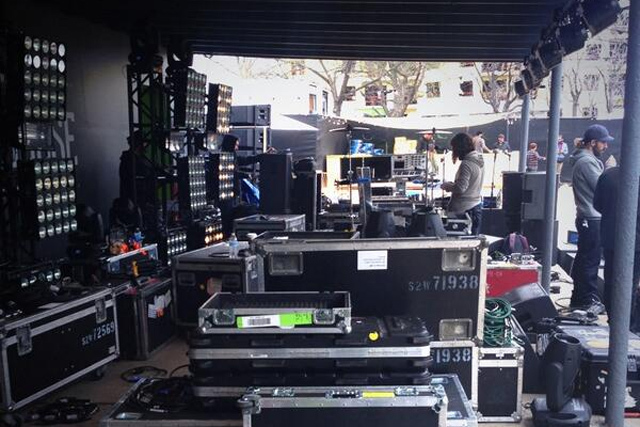 A sneaky peek at the area getting set up for the bands to play in at the Spotify House. Here is a selection of Marketing's pictures from SXSW interactive so far.